Providing a real alternative to waste ending up in landfill. 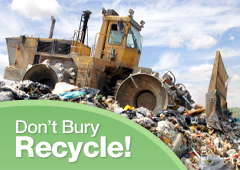 Guaranteed responsible recycling, all waste is tracked and all suppliers are carefully audited. Evidence for your company to demonstrate compliance - You will be issued with an annual waste transfer note. Cost effective - Save a Cup is not for profit and as such the charges are kept to a minimum. A step towards maintaining or obtaining the ISO14001 accreditation. Helping to reduce your carbon footprint. A demonstration of your company’s environmental commitment. A visible sign that your business is behaving responsibly.